Colourful, competitive, diverse, professional, skilful, teamwork… are all key words that you can attribute to the Reina Group and they came to the fore last Friday at Sene Valley Golf Club. 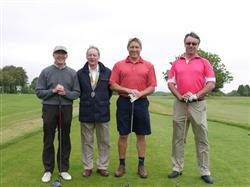 The Reina Group team of Ricky Reina, Howard Cocker & Peter Graham successfully defended the Rotary Club golf trophy in blustery but sunny conditions overlooking the English Channel, in a well attended competition comprising of over 30 local teams in support of this charitable event. The banter started on the first tee with current club President Peter Godden trying to put pressure on Howard’s first drive but to no avail as he almost drove the green.